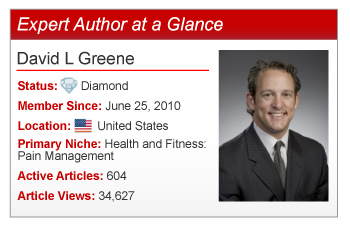 Ranked as the number 1 Expert Author in Pain Management, Medical Entrepreneur and Internet Marketing Expert David L. Greene shares his training in orthopedic surgery and his knowledge of medical devices to empower his readers. As a fellowship trained spine doctor, David has chosen to devote his career to the business side of medicine and write articles to target the needs of his clinic’s patients (and those with similar needs around the world). This shift in focus allows David the ability to write more articles, but not lapse on the quality. David admitted one challenge to writing was learning how to take a subject or topic he’d previously written about and to not simply re-write the topic. Discovering that every topic can vary as much as an ankle injury, David said his solution is to take a new twist on the topic so the information is fresh and adds to the previous article. Try David’s methods to amp up your own article writing efforts. Find innovative solutions for time management, give old topics a new twist, and write consistently to increase the volume of your portfolio of quality, original articles. Do you have a question or comment for David? Feel free to leave it in the comments section below. How can Google alerts help you in article writing? By setting up Google alerts for your pen name(s) and your article titles, you can be notified when one of your articles has been picked up by a reputable publisher … or posted in error without proper attribution. This will help you better understand how your articles are being used (or perhaps misused). Please let me know how I can set up Google alerts. Could you please tell me How I can use my resource box to get optimum advantage? Are we permitted to use company’s name is that or not? David congrats on the awesome publicity. Keep up the high quality articles with your article marketing efforts. If you had to start all over again, why would you make all of your articles over 400 words? Randall, many of my articles have been over 400 words. When I first began, I thought that only those of 400 words would be acceptable. I find that my longer articles are better than those that just meet the minimum. I have learned much. Thanks for responding. I have the same thought process about creating articles under 500 words – so i see where you’re coming from. Like you, i have learned much also. I have been doing article marketing for the past year and i learn something new each month. A heartily CONGRATULATIONS to Dr. David. You have really built a great inspirational image for all. Randall, if you will explore the Writer’s Market Directory, you will see that they want writing pieces which are from 800 to 2500 words. I am thinking about doing some articles for some of the magazines in the Directory. I have 28 published by EzineArticles and I have only been writing them since November of last year. I have been writing since I was a teen, but haven’t marketed them. Now I would love to sell. I am living with cancer and my first articles was about that and I plan to follow it up with remission and return and still living with it. Good luck for longer and better articles to you. thanks for the interesting recommendations, from which I think I understood that google alerts is intended only as a hint to identify new research trends. Right? thank you so much for your contributions and I congratulate you on your achievements. Thank you all for the congrats! To clarify on Google Alerts, I’ll give an example. I use the term “pain management” to see what research is coming out or emerging procedures that I might want to write about. I do the same for orthopedics, oil and gas, and more if I have an internet marketing clients in those areas. I receive a daily email with what Google collects from the web, and it’s like an automated “brain storm” of ideas! You are providing so much valuable information to people who need to read what you are sharing. As a former professor of health and physical education and currently a licensed mental health counselor and bodymind therapist, I read so many newsletters and journals about healing, mental health, pain management, marriage counseling – so much that is not reaching the clients who need to read this. So much is written for professionals and shared among professionals. I see part of my task as one of sharing the valuable information in a way that the average person can understand it. That is one thing that EzineArticles.com allows me to do. And it seems that you are doing this also.